2011 has been a golden year for Ambergris Caye. 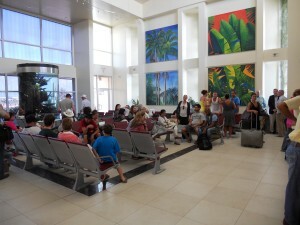 Tropic Airlines reported that, once again, they broke their own records for the number of flights arriving at the San Pedro, Ambergris Caye, terminal in April. Golf cart rentals were also totally sold out the week before Easter.The trend is indeed encouraging. Another positive factor - Frontier Airlines has signaled that they will commence flights to Belize later in the year. Island residents who have recently visited other parts of Belize noted that the number of tourists visiting other parts of Belize were not as notable as on Ambergris Caye.Â Apparently, Ambergris Caye is still the number one destination for visitors, expats and investors.